Pittsburg boys took third in 5A basketball. 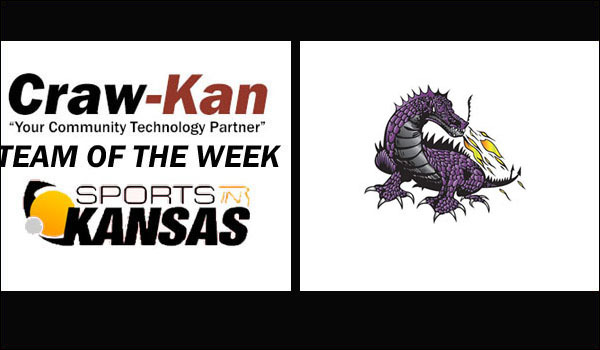 The Craw-Kan "Your Community Technology Partner" Team of the Week from the Southeast Kansas coverage area is the Pittsburg High Purple Dragons boys basketball team. The Dragons, led by head coach Kiley Roelfs, got their highest finished by taking third in 5A this weekend in Topeka since 1997. Marque English, a senior forward, was named to the Sports in Kansas 5A Boys All-Tournament team. English finished his career with over 1,000 points and should be a two-time All-State pick in 5A when the teams become released next week. Pittsburg also had big years from Chase Curtis, Drew Roelfs, Gavyn Elkamil, Jerek Butcher, Trenton Austin and Javon Grant. Pittsburg went 2-1 over the week/weekend as they knocked off Seaman on Thursday for their first state tourney win in 21 years before falling to Salina Central in the semis on Friday night. They finished the season off strong with a win over Mill Valley to capture third place. Pittsburg finished the season at 21-4. Craw-Kan "Your Community Technology Partner" would like to congratulate the Purple Dragons on a great season in 5A!